Currently involved with a illustration commission, of a book in the fantasy genre, I was requested to portray for one of the chapters an "older, bearded, robed man". Well, with a description like that, what else could possibly come to mind but "Gandalf", the ever wise and stalwart wizard of J. R. R. Tolkien's 'The Hobbit' and 'Lord of the Rings' fame...? I was imagining the character of Gandalf in my mind as I sketched this little scene. 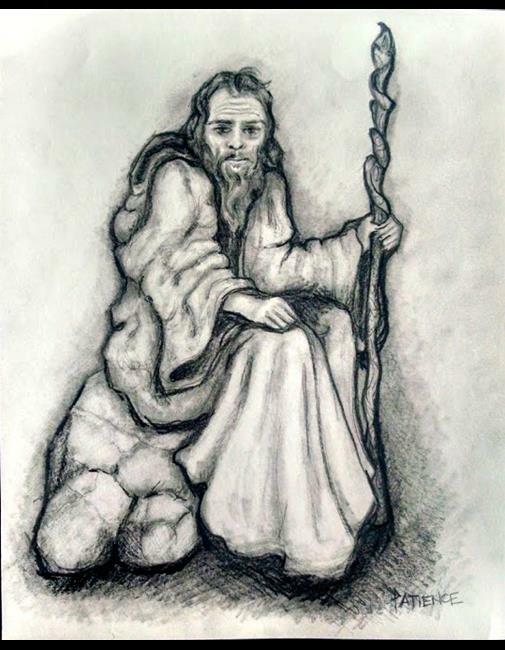 Gandalf, the 'Grey Wizard' -- a bit tired, impatient and weary perhaps in the face of fighting the terrific, overwhleming evil that is Sauron -- yet tenaciously committed, and determined. How could I not be inspired by Tolkien's visions of this strong iconic character....? So while my client's book isn't actually about 'Gandalf' or anything else 'LOTR'-related, in my own heart of hearts that's what I ended up drawing here. Couldn't help myself....!